SKU: N/A. Category: Courses. Tags: data science course in bnagalore, data science training in bangalore, data science with R programming training, learn data science online. 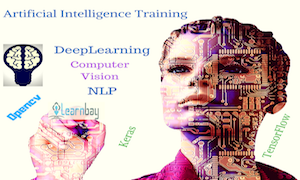 Learnbay Provides artificial intelligence training in bangalore which includes Deep Learning ,Natural Language Processing And Computer Visison.Our course helps you to learn various deep learning techniques using Python programming. Course content is designed by experts to match with the real world requirements for both beginner and advance level.Many real world problems and case studies are implemented throughout the course and discussed in the class with tons of assignments for practice. This course will benefit you to master Deep learning Skills ,NLP and computer vision Which will prepare you to become a Artificial intelligence expert. Chat on Whatsapp Now With Expert! You should be familiar with Python Programming and Machine learning to be eligible for this course. Practical Approach With Mini Projects And Case studies. What is Artificial Intelligence? – Introduction. Problems that Deep Learning Can Solve. Understanding Keras API for implementing Neural Networks.